Eureka! Split scoops are available on a sugar cone! For the ice cream novice, a split scoop means you avoid the agony of decision when you really, really want two flavours but only want a single scoop's worth of ice cream. 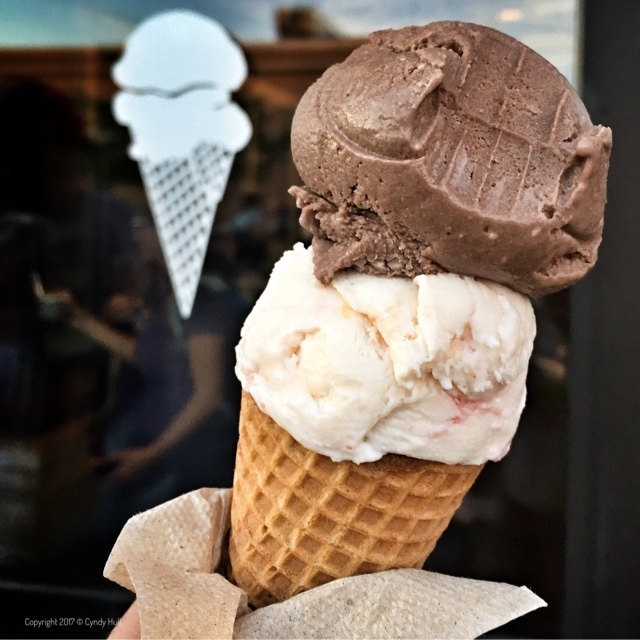 Featured flavours are Chocolate Sorbet (dark chocolate with a subtle undertone of coconut) and Strawberry Rhubarb Jam (with homemade jam - I'm not making this up!). "My, what lovely teeth you have, my dear!" "The better to eat you with!!" Lovely, simply lovely. And memory-filled. Apparently, Sweet Peaks is one of our family values!